Non-GMO certified. Free from known allergens. Suitable for vegans. Suitable for vegetarians. Suitable for coeliacs. 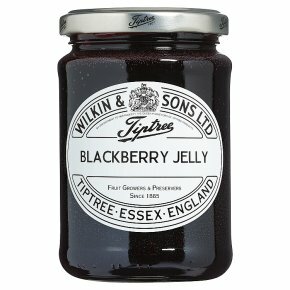 Kosher - KLBD.This traditional jelly is made from the wild fruit of the blackberry, producing an intense flavour. Blackberries are brought to the boil and simmered for 10 minutes. The juice and fruit is then pumped into our fruit press where it is squeezed to extract the maximum amount of juice from the fruit.